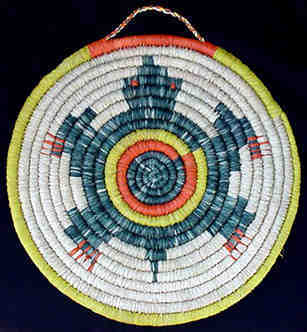 An attempt at a Hopi-style plaque, made with pine needles and raffia. "The turtle is in green with bright orange claws and eyes. and the design is coiled perfectly. The center of the turtle is a coil of green turning into orange and then yellow. This is all on a natural background color with a outside frame of yellow coiling."